Granny squares emerge from a riot of color in this postage-stamp quilt designed by Carmen Geddes. Piece this classic quilt (see below) with NO strip piecing! Fun! Fast! Accurate! Enjoy perfect corners every time. Use Easy Piecing Grid foundation to make your heirloom. Amazing 2” finished squares. Carmen will share her tips to making this lovely piece without the frustration frequently experienced in piecing. If you are a beginner this class is for you! The fabric yardage is broken down to six colors plus a chain color (black in Carmen’s sample). In addition to the six fabrics, Carmen suggests adding a few more colors for your blocks (using fat quarters or scraps). Or have a little extra yardage of your six colors. If one color is over-used, you may run out before your quilt is done. 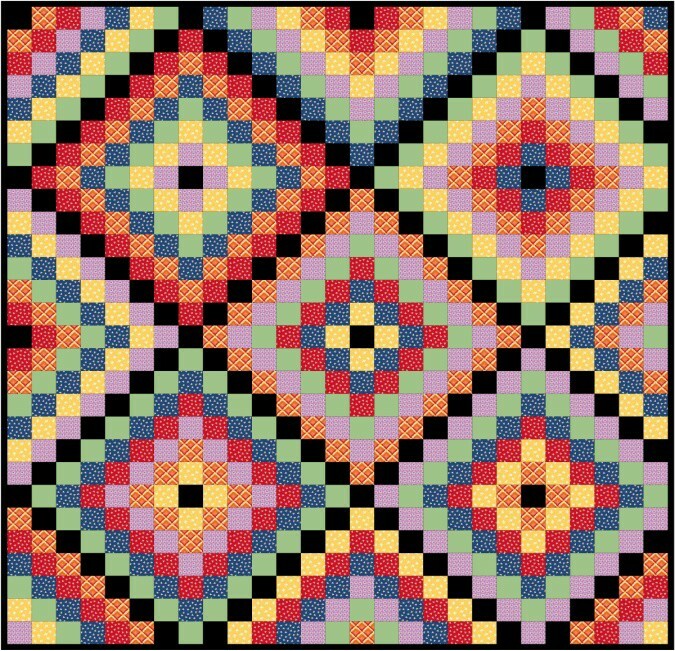 It would help you to pre-cut 2.5″ squares — 40-60 squares of each color to get you started, and 80 chain squares.